Following improved freight rates in the dry bulk sector, more good news for the sector has emerged in the latest report from market data provider Vessels Value. In short the combination of vessel scrapping and increased ton-mile demand have collectively boosted asset valuations ahead of expectations. Hire rates are surging, which is encouraging investment in dry bulk carriers. The dry bulk fleet is now worth more than the combined value of the tanker fleet, leapfrogging container ships as well,” the report noted. 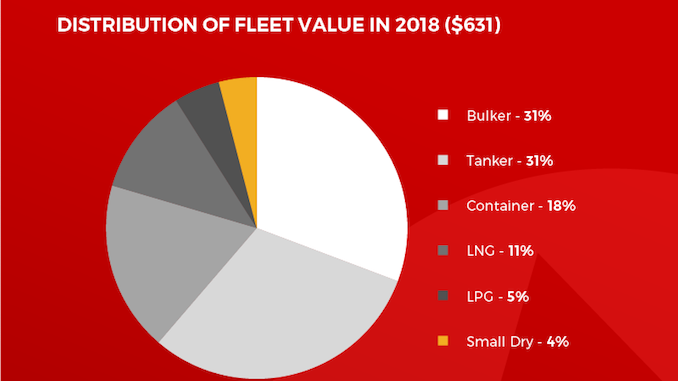 The above chart shows the distribution of fleet value in 2018. The value of the tanker fleet has slipped by almost US$50bn from 2015 to the present, while bulkers have appreciated by a net US$56bn. Tankers appear to be in the middle of a down cycle, which has depressed the valuation of the tonnage on the water and the outstanding orderbook to second place. Although the top three vessel segments have shuffled places, gas carriers and small dry ships held onto more historic trends. Overall the value of total freight carrying assets fell by about US$43bn from the end of 2015. Across the global fleet Bulkers now account for 31% of the value, as does the tanker fleet. Containerships account for 18% of overall global fleet value. LNG carriers are 18% and small dry bulkers account for 4%.